There is a particular eloquence to be found in grief, a hollow beauty in the ugliness of pain, and few gifts in life can rival that of being able to simply say goodbye. Regret is an inevitability of living, and life itself offers too few second chances when poor choices are made. 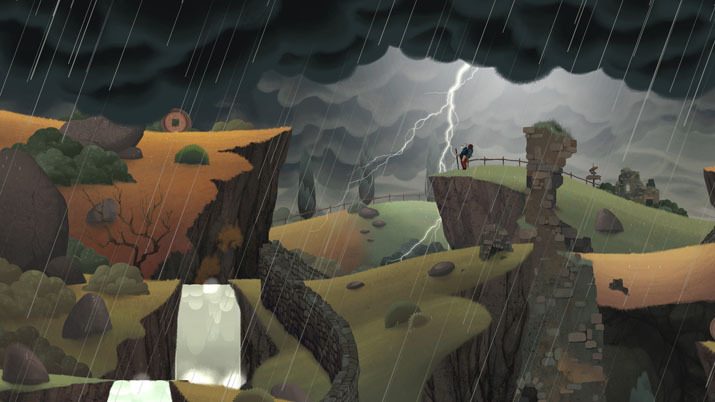 Old Man’s Journey makes all this abundantly heartfelt as you delve into the memories of an old man. Created by Broken Rules (and when they say “broken rules” they MEAN it; website? Brokenrul.es. Enough said.) with a jaunty, uplifting, and yet haunting musical score provided by Scientific, Old Man’s Journey offers a whimsical, thought-provoking trip through the memories of, you guessed it, an old man. 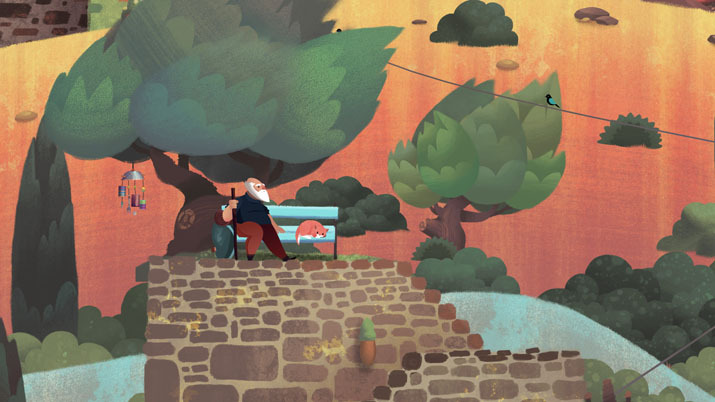 A nod to the Vienna Business Agency for making an Old Man’s Journey possible, as well as website crediting to Stefan Kernjak helped me realize that this wouldn’t simply be a title that promised “A game about life, loss and hope,” but one that would actually deliver. 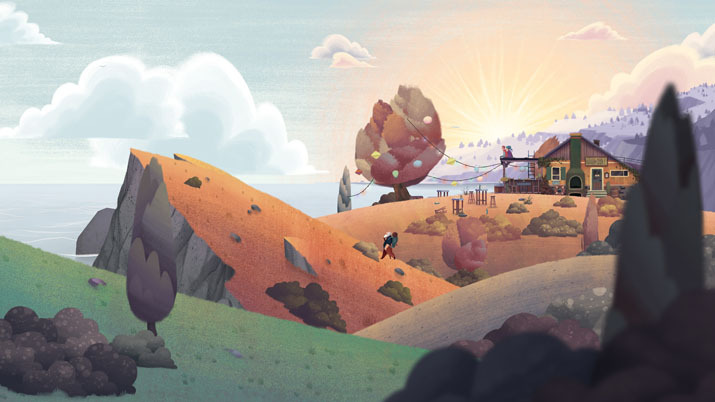 Old Man’s Journey is a puzzle-adventure game as beautiful and straightforward as its website highlights. Poignant art, melodic tunes, only the words that are necessary, and a charismatic trailer are all there to pull players into its colorful atmosphere. The impression that every single action and visual provided is carefully and strategically thought out is evident, and once gameplay commenced, I for one was not disappointed. This is not a lengthy title. Expect to complete it in under 2 hours. That's mighty short, yet that's ok: Old Man's Journey delivers a lasting sense of calm and relaxation you’ll enjoy long after you’ve finished it. It’s full of inspiring art, music, and imagery, it’s a game free of words in which the protagonist, for his story and his memories, find an open path to somehow become yours. Take my experience with the opening sequence, for example. Standing with the Old Man upon a cliff, I stared at a beautiful sky splayed out behind a ramshackle yet lovely lighthouse/cottage, the sea gently lapping away in the background. The immersion worked. I felt, had I simply closed my eyes at that moment, that the spray of the sea would have kissed my face, the sun would have warmed my body. And when the old man received a letter from a jovial postman, I grew nervous. Tension filled my body. I didn’t want to know what that letter might contain. That letter that made the Old Man suddenly age. What secrets lie in the letter aren’t to be revealed. At least not in words. What follows is a wondrous journey, as our Old Man grabs a knapsack that feels hefty, as if he was carrying a lifetime of regrets inside. He heads out, presumably to find the letter’s author. A myriad of puzzles are just around the corner. Click-and-drag the earth, roads and boats to help this ole’ guy get to where he needs to be. Jump on a truck, hop on a train. Even drive a ship. Click the earth, the road, the water and the boat. Any obstacle that challenges the old bugger, you can pull, push and prod to create a path he may follow. Click and raise a hill to build a new road; manipulate a slope to send a giant disk crashing into an ancient rock wall. Drag a twisting mountain mess into a safe country road to be traveled in the back of an old pickup truck, and much more. Thankfully, none of the difficulties encountered gave me an aneurysm trying to complete. Few were a bit trickier, and the intensity does grow as you progress through the landscapes of both the earth and the old man’s mind. That’s partly because the story unfolds as the Old Man progresses through the magnificent vistas. His memories are unlocked, sometimes naturally, sometimes through tinkering with his surroundings. These vignettes are compelling and engaging, and even more remarkable is the fact that even lacking words they are very clear, and it’s easy to slide into his psyche. A sense of urgency, too, grows as you progress. One that is intrinsically tied to these memories. I found myself quietly begging him to move faster as we proceeded, blind to his purpose but certain that there could be no time to spare. There is also nostalgia felt, while watching him move from challenge to challenge. Finding his way through terrain that would test the most ardent of adventurers, a feeling that all of us have faced at some point in time because of life’s challenges and the decisions we must make. All that usually accompanies poignant sadness that, perhaps, I didn’t meet them as gracefully as the Old Man. The difficulties of love, and parenthood play into this title, as well as a hint of the pain that goes with Wanderlust; I remember my Grandfather, eyes as blue as a summer sky, staring off into the distance as he recollected his days as a hobo, working the rails. I saw and innocence there; a confusion as though his need to be still with his family was counterbalanced by the call of the world, incessantly pulling at him for one more adventure. I think, he would have felt an innate connection with Old Man’s Journey. I know I did. Having spent her formative years as the only child on a farm full of goats, geese and guinea hens, it should come as no surprise that Carrie Luna is a bit...different. Familiarizing herself with RPG's before she even knew that would ever be a "thing", Carrie spent 6 years of her life flipping between her alter-egos of Spiderman, and Ponch from CHiPS. When not role-playing alone, Carrie studied physics, convinced she too, could turn into Wonder Woman if only she held her arms at the correct angle while spinning. Once she made it off the farm and realized chasing geese was definitely NOT the social norm, Carrie immersed herself in fantasy novels and a love of all things Terry Brooks. That love led to the joy of writing, reading, and ultimately gaming. Carrie now lives in Minneapolis, with her 8 year old daughter, her 12 year old Chihuahua, and her tattoo artist husband. Rest assured, they are all as strange as her. She may, on occasion, still chase geese.